Pompeii is one of the World’s great archaeology attractions. And more of it is being uncovered every day. Here is our brief guide to the latest research and discoveries. Until recently, Pompeian archaeologists spent most of their time clearing volcanic debris to expose extensive areas of the city or trying to classify the architecture, frescoes and artefacts uncovered. Now all that is changing. Only small areas are excavated at one time, but the idea is to dig deep, going below the AD 79 level to see a sequence of layers and tell the story of the city from its origins. At the same time, house layout and interior design are being analysed to reconstruct the city’s social and cultural life. In the hands of a new generation of researchers, ancient Pompeii is returning to life as never before. Was Pompeii destroyed by falling pumice and ash, and Herculaneum by slow-moving flows of boiling mud? Were Pompeii’s victims killed by falling rocks, collapsing roofs, and suffocation inside rooms buried by the deluge? Did all the people of Herculaneum, on the other hand, escape? So it used to be thought, but in the last 25 years vulcanologists have challenged the traditional view of the eruption. Combining the evidence of Pliny the Younger’s letters, the study of exposed volcanic strata in the Bay of Naples, and the experience of other eruptions, such as that of Mount PelÃ©e on Martinique in 1902, they have developed a new — and far more terrifying — account of what actually happened on 24-25 August AD 79. The Romans knew that Vesuvius was a volcano, but they thought it extinct. They had no record of any previous eruption. (The last — unknown to them — had in fact occurred in c. 1200 BC.) Then, on 5 February AD 62, a violent earthquake reduced much of Pompeii to rubble. Damage was such that reconstruction work was still unfinished 17 years later. Probably, something was already happening to the mountain: a fracturing of the edifice by the movement of magma from the main chambers some 5km below the surface. But AD 62 was followed by a period of relative calm: the occasional quake as magma shifted further beneath the crust, but nothing on a comparable scale. On 20 August AD 79, however, major activity resumed with a series of quakes, increasing in frequency over the succeeding four days, as magma forced its way upwards into the feeder pipe of the volcano. Springs dried up around the mountain. Finally, at approximately one o’clock on the afternoon of 24 August, Vesuvius exploded. The carapace of rock sealing the mountain was blown out, and a great brown column of pumice and ash rose vertically into the atmosphere, quickly reaching a height of about 15km. ‘It’s general appearance,’ Pliny wrote, ‘can best be expressed as being like an umbrella pine, for it rose to a great height on a sort of trunk and then split off into branches.’ The ‘umbrella’ — the spreading cloud at the top of the column — was driven south-east by the wind, and about half an hour after the explosion Pompeii, about 9km away, was shrouded in darkness and began to be pelted by pumice. This ‘Plinian’ phase of the eruption lasted 18 hours, at first gaining force as the magma ripped rocks from the side of the vent and as subsidence collapsed more of the rock carapace, creating a wide ‘caldera’ through which far greater masses of material could reach the surface. At peak intensity, the eruptive column reached a height of 30km or more as the mountain ejected 150,000 tonnes of material per second. Altogether, in the Plinian phase, an estimated 2.6 cubic km of rock was blasted into the sky. The air-fall of ash, pumice and occasional rock fragments, accumulating at about 15cm an hour, eventually covered Pompeii to a depth of almost 3m. Many flat roofs caved in under the weight. Sometimes people sheltering beneath were killed. Outside, fugitives waded through loose pumice in the darkness, trying to make their escape, and a few unlucky ones were struck down by rocks, falling tiles or collapsing masonry. But overall the Plinian air-fall phase claimed few victims, and many hundreds were still stumbling around in a grey desert of pumice on the morning of 25 August. The mountain had not finished its work, however, and only now, in the final six hours or so of the eruption, did it became truly lethal. During the night the eruption had changed its form. The gas-rich magmas from the upper chambers became exhausted, and heavier magmas from deeper down began to reach the surface. The difference is seen today where layers of grey-green pumice overlie those of white pumice. There were also violent tremors. As the discharge of magma cracked and collapsed the rocks overlying emptied chambers, the shocks rippled across the bay. The land was shaken by earthquakes. The sea was sucked back and then hurled at the beaches in seismic tidal waves. These changes heralded the onset of the ‘PelÃ©an’ phase of the eruption. re, instantaneously killing all but two of its 28,000 inhabitants. Pyroclastic surge deposits — and closely associated pyroclastic flow deposits — form the upper layers of the Vesuvian strata at Pompeii. Six separate flows, amounting to 20m of volcanic debris, covered Herculaneum, which, being 5km due west of the mountain, had suffered minimal air-fall. It took perhaps five or six minutes to reach Pompeii from the lip of the crater: a dense, rolling, ground-hugging mass of gas, ash and rock (the pyroclastic flow), preceded a few seconds in front by a scorching blast like that from a flamethrower (the ground-surge). Walls were thrown down, columns toppled, tiles shot like cannonballs down the streets. At its hottest, where temperatures reached anything from 400 ° to 800 ° C, the ‘black cloud’ carbonised wooden timbers, doors and shutters, and killed those it struck instantly, as brains boiled and skulls exploded in the flash. Others, where the heat was less, were asphyxiated as they breathed in hot gas and incandescent ash. This is how we see them still, captured at the moment of death, rigid in burn-shock and gasping for air. In the closing stages of the eruption, after the pyroclastic discharges, magma and water mixed with explosive force, ejecting particles of fine ash and welding them together to form ‘accretionary lapilli’. As these floated onto Pompeii, they moulded themselves around bodies and solidified, preserving the shapes of the dead after the flesh had rotted away. In 1863 the Italian archaeologist Giuseppe Fiorelli devised the technique for recovering these shapes by pumping plaster into cavities before the volcanic overburden was removed. By late afternoon on 25 August the eruption’s force was largely spent, and by dawn the following day calm was fully restored. In the 24 hours plus that the eruption had lasted, it is estimated that Vesuvius had unleashed thermal energy 100,000 times greater than that of the atomic explosion at Hiroshima. The result was the obliteration of a large chunk of ancient Campania. Towns like Pompeii were never rebuilt. Eventually even knowledge of where they had lain was lost. How many escaped? We do not know. The people of Herculaneum, once thought to have got away, were found in excavations on the ancient waterfront in 1980, huddled on the beach and in boatsheds — hundreds of them, where they had died trapped between a seismic sea and a burning gas cloud. As for the Pompeians, though most had clearly left the city, did they in fact survive, or are the roads south clogged with the bodies of refugees felled by pyroclastic surges? Many macabre secrets still remain entombed beneath the volcanic debris of AD 79. It’s ten years since I began work in Pompeii. Over that time the annual number of visitors has grown by a million, so that now about 2.5 million come each year. Why do so many come? When you walk along the streets lined with buildings destroyed in AD 79 you feel a chill reminder of your own mortality. Pompeii is also unusual among the great monuments of the world because here were once the homes of a complete living community, perhaps 12,000 people. Nowadays it’s a gentle walk of 25 minutes from one corner to the other. There’s a paradox: it was a small town, but it’s an enormous monument. When you visit Pompeii, you find the bars and workshops of the humble alongside the mansions of the rich. Conserving the amazing wall paintings and mosaics presents difficult problems, but there are also real issues about how to treat the modest houses and shops. They may have no fine decoration, but they are an essential part of the complete city. If a wall in a bar falls down, the whole site is diminished. Despite the daunting problems, there are positive new developments. The first decisive step came in 1997, when a special law was passed in Italy, giving the Soprintendenza Archaeologica di Pompeii an unprecedented financial autonomy. This meant that all the gate receipts are now kept and spent in Pompeii. The funds available for conservation and improving the experience of visitors have increased by roughly four times. The current Soprintendente, Pier Giovanni Guzzo, has spearheaded these new initiatives. In the six years since the law was passed, progress is tangible. For the visitors, there are new signs, leaflets and itineraries, and an excellent audio guide system. Across the site there are programmes of conservation under way – such as in famous houses like the House of Menander and the House of the Vettii. However, even with the increased funds, the needs of this site are so great that some have despaired that it can ever be preserved. The Soprintendenza has long welcomed initiatives from outside to help their efforts, and now there is an increasing momentum of people coming forward to help. In November 2003 an initiative from the World Monuments Fund and the Kress Foundation, both based in New York, sponsored a meeting in Pompeii that brought together a range of archaeologists, conservators, architects and other specialists to compare ideas and look forward to co-ordinating efforts and sharing best practice. This was an exciting occasion, revealing both the scale of the problems and the will to do something about them. The experience of our own Pompeii Project illustrates the shift of attitude to look beyond academic research that’s now growing among Pompeian scholars. In the course of our decade of work, we’ve inevitably got to know every corner of our block, Insula VI, 1, and become painfully aware of the poor condition the masonry is now in. This is what happens after two centuries of exposure. In common with much of the site, exposed frescoes have deteriorated and protective roofs erected in the mid twentieth century are proving inadequate and are deteriorating themselves. When we complete our field research in 2006, we don’t want to just walk away and let the deterioration continue. At the same time we want to communicate our results to visitors. Our efforts have produced a fantastically complex story of the development of life in the block over four centuries, from the urban history to the toilets. This is a more richly textured account of ancient Pompeii than visitors get to learn at the site. During our field seasons, we provide multi-lingual guides to explain what we’re doing to visitors passing by, but we feel a strong responsibility to create a more permanent expression of what we’ve found out. the importance of the site, and actively want to preserve it. So encouraging tourists is essential to the sustained future of Pompeii. How do we support the Soprintendenza in these shared ambitions? Our own contribution is to establish The Pompeii Trust, registered as a UK charity in 2002 (http://www.pompeiitrust.org/). It’s the first organisation in the world set up specifically to support conservation at Pompeii. We’ve commissioned a detailed conservation plan from London-based consultants Academy Projects, and are now working to raise money in the UK and the USA to implement our plans. But our initiative is by no means the only one. The World Monuments Fund and the Kress Foundation have made a major investment in plans for the House of the Silver Wedding. The University of Bologna has worked in the House of the Centenary. Meanwhile the Packard Humanities Institute and the British School at Rome have begun their significant programme at Herculaneum. An international effort is beginning to build. There’s a growing recognition that Pompeii is such a special site that there’s an international responsibility pressing now on our generation to make it survive for the future. This has to be expressed through supporting the lead role of Pier Giovanni Guzzo and his colleagues in the Soprintendenza Archaeologica di Pompei. There is a successful parallel in Italy. More than 30 years ago international opinion was mobilised in the face of the threats to Venice. International committees were set up around the world. In Britain we have the Venice in Peril fund. They have contributed large sums to the efforts led by the Italian authorities. The time is right to do the same for Pompeii. The last ten years in Pompeii have been an exciting time for archaeological research. Colleagues from many countries have produced new insights into Pompeii’s past, how it grew into the city destroyed in AD 79. There’s new hope that in the next ten years a co-ordinated international effort will begin to ensure its future. Current World Archaeology Issue 4 is a special issue devoted to Pompeii. In it we describe all the latest digs and discoveries that are going on there, as well as full details of what to see and what to do when you go there yourself! Below is a brief list of all the latest work which is covered in full in the magazine – click here if you wish to purchase the a copy. First we report new thinking about the eruption itself. The old idea that most people died under a rain of pumice has gone. Now vulcanologists believe most survived the ‘air-fall’ but were killed by the searing heat of ‘pyroclastic ground-surges’ during the last and most terrible phase of the eruption. But is the picture accurate? CWA editor-in-chief Andrew Selkirk challenges the ‘greed is good’ interpretation of Pompeii and offers an alternative: a city where a wide range of society benefited from the prolonged economic boom in the two centuries before the eruption. 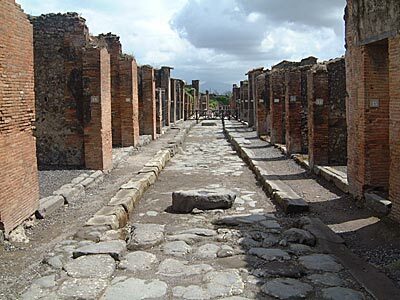 Our next article reveals that Pompeii was threatened by traffic gridlock but for a one-way system enforced by the local council. Then, from the congestion and noise of the city streets, we first accept an invitation to dinner at the House of the Chaste Lovers, and then get an introduction to interior design and lifestyle choice in the ancient city. Currently there are no direct flights from the US to Naples – most flights transfer at Rome or Milan. Most of the nicer hotels are situated in Sorrento and the surrounding area which has good transport links to Pompeii, Herculaneum and many of the other attractions in the area. Click on the map to launch the full size map.